fix a few videos with bad white balance? it was set to incandescent while being outdoor scenes. can it be done with a free / opensource product? On a Windows Based System you can use the Sony Vegas PRO and Sony Vegas Movie Studio, which has several plugins which you can apply in a per-track and/or per-event basis. The "per-track" option may allow you to place a bunch of video clips in the same track on your timeline so that the same color correction preset or customised parameters will be applied to every event in the timeline, after which you can run individual rendering for each instance or a finished one-clip movie made with all the events. The next links provides a quick view on certain useful plugins and their corresponding usage for such tasks. Remember that the same plugins may appear in both the Movie Studio and the Professional edition of Sony Vegas if the installation for both software was made using the same Shared Folder for Plugins. I have made some color correction in the past, both with Sony Vegas and KDENlive but I can't provide at this very moment some personal illustrations, so I got some from the web. 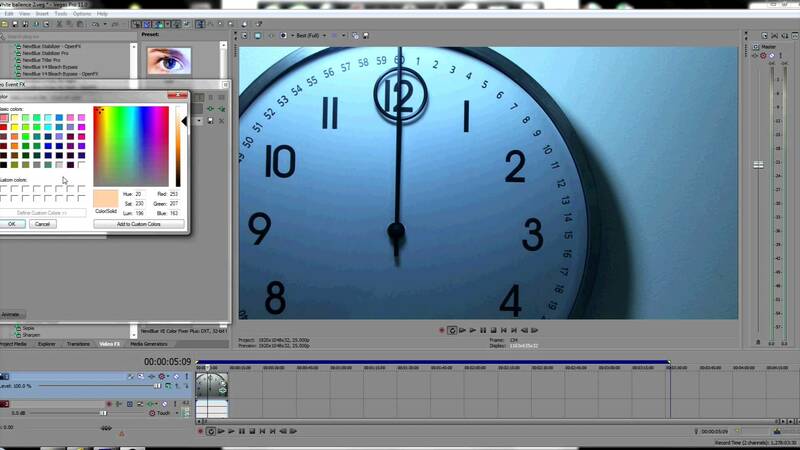 The same as in Sony Vegas, KDENlive will allow you to do this task for a per-track/event basis. It can be, basically you need a program with some sort of color corrector. In Premiere its called the three-way color corrector/fast color corrector, in vegas, its secondary color corrector I believe. In PP, using three-way color corrector/fast color corrector, all you have to do is select an area that should be white in the frame using 'white level' and it will figure it out for you. Alternatively, you can go to the midtones section, and drag the color pin in the opposite direction. So for you, the video is too blueish, and thus you need to add some warmth or yellow/orange. 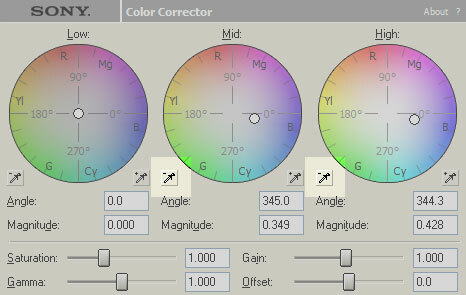 The above is a picture from Sony's color corrector (same principles apply as in PP). Basically, in the 'mid' section (its always the center color wheel), you want to move the dot between the Red and the Yellow areas or between 90 deg and 180 deg until you feel you have compensated enough for the white balance mistake. Bare in mind, if the white balance is really off, this will also change the dynamics of the other colors and may look weird, so experiment with the highs and lows as well by compensating for this effect. You can use rgb scopes and vectorscopes to determine if you are doing things correctly. In your case you have a spike in the blues right now, and not enough red, so the closer those spikes get to each other within reason the better. If you have skintones this can be complicated. 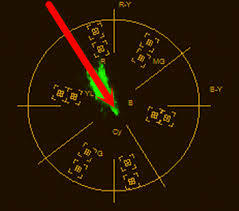 But generally, you want the vectorscope to show a line of 'data' around 120 degrees (the skin tone line - seen below). Not the answer you're looking for? Browse other questions tagged video video-editor color-correction or ask your own question. Recording video's with two cameras? Easiest way to stitch GoPro videos that have been split due to length? Wedding Footage from beach - fixing over-exposure and colour balance? 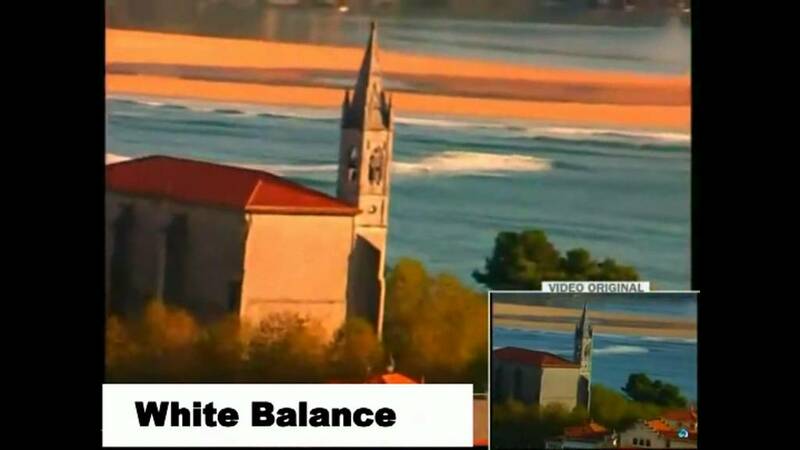 How to fix white balance gone bad? How do I temporarily disable Davinci Resolve nodes? How can I ensure the white balance is correct? Leaving white balance for post-processing. Is it a bad idea?